No one will ever love someone like me. They’re looking at me because of my disfigurement. I watched a report about a model who had acid thrown on her face. Despite all the surgeries, the scars still showed pretty clearly. She handled it well…I just hope in future years, they’ll come up with a way for people to get face transplants. Having a visible deformity does tend to drive someone into his/her shell, I would think. 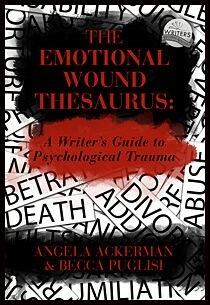 Right now Becca and I are still developing this thesaurus, but it appears to be very popular, so it will either be developed further at One Stop For Writers, turned into a book, or both! (just not yet–we need to work on it a bit further here first and have two other books on setting to release first (Spring 2016).